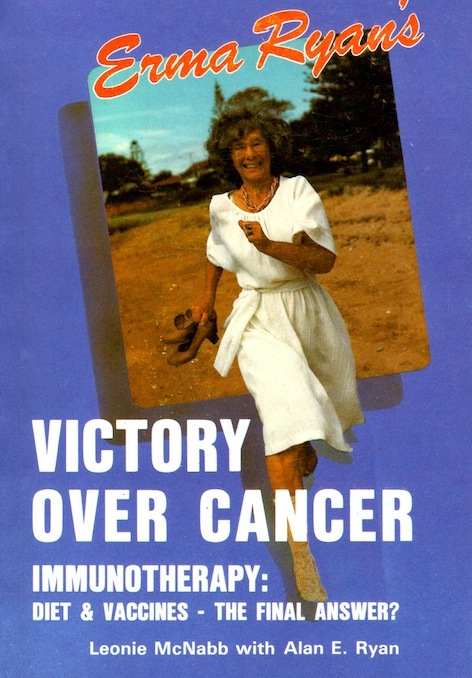 Emma Ryan's "Victory" is a book by a patient who turned to dietary modification, meditation, nutritional supplements and various immune-modulating therapies for remission from "the death sentence" imposed by orthodox medicine. Immunotherapy - Diet and Vaccines The Final Answer? "We command nature only by obeying her." The words of Bacon become more meaningful day by day in our polluted environment. The use of chemicals in our food and water supplies and the impossibility of breathing clean air are major contributing factors to the decline in our immunological resilience. Erma Ryan's Victory is a true story of the body's ability to recover if it is given the optimum environment internally and externally. Erma is one of hundreds of thousands of patients world-wide who are turning to dietary modification, meditation, nutritional supplements and various immune-modulating therapies for remission from "the death sentence" imposed by orthodox medicine. This book documenting the principles and practice of the Livingston-Wheeler Clinic, is in my opinion, well written and should be read by all cancer patients, their physicians, people at risk of cancer and our politicians.